Minimum of four switched events. To be controlled by either a PC COM port for data modes or regular Microphone PTT for SSB use. Provide “TX inhibit” for rigs that support it. Simple design and construction using readily available parts. Having looked at many different solutions I found that the W6PQL sequencer met my requirements the closest. 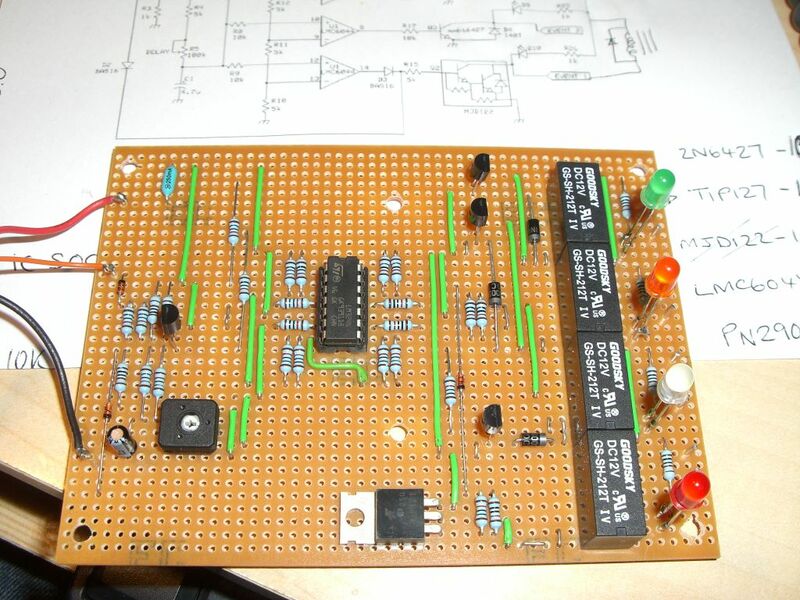 I built the sequencer on basic copper strip board and added four relays and “jumpers” so that for each event I could either switch the line to ground, provide 13.8V or in the case of the LNA switch the 13.8V supply off. The LEDs were only in place during testing and were moved to the front panel when the circuit board was fitted into the box. To house the sequencer I used a standard “Eddystone Die-cast box”. The photo shows most of the hardware in place. An additional toggle switch was added to the front after this photo was taken. Switch between Com port or Microphone PTT control. Bypass the PA and run the rig barefoot. The four LED’s light as each event is enabled. 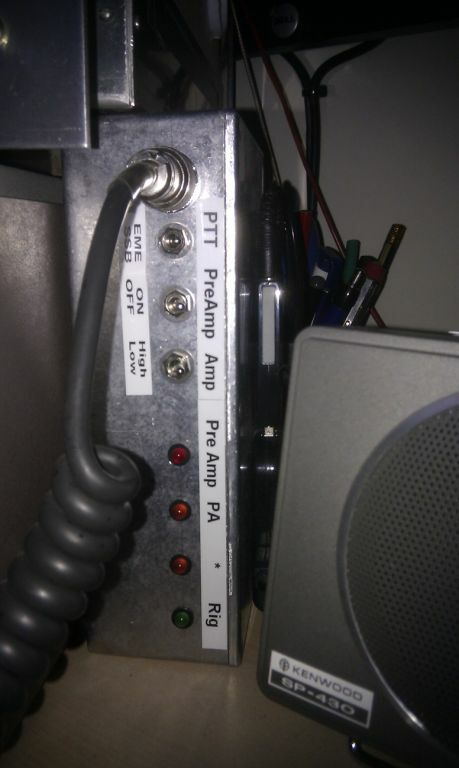 The Microphone sockets on the front and back panels allow me to “break” the PTT line to the TS2000 and use the controller to enable TX / RX. So now the standard microphone simply plugs into the squencer and a new 8-way (1:1) lead goes from the sequencer to the microphone socket on the front of the rig. 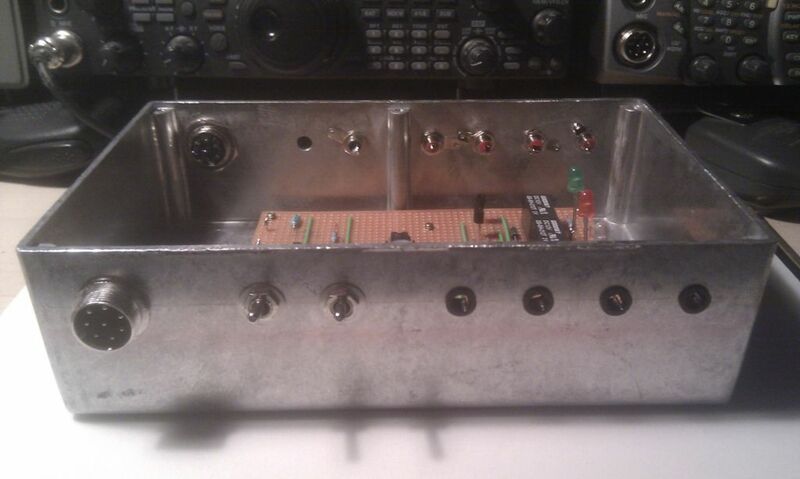 Here you can see the (almost) completed sequencer.